Looking for a fun way to follow the State of the Union? BINGO! You feel like it is your duty as a conscientious American to watch tonight’s State of the Union address at 9 pm EST, but you don’t relish the prospect of spending about an hour listening to the president talk about things he has already discussed for the most part or watching lawmakers selectively applaud at his lines. The growing concern about America’s mounting national debt and the inability of our elected leaders to adequately address it has led to many calls for a balanced budget amendment (BBA) to the U.S. Constitution. Given our current fiscal problems, the attractiveness of requiring federal spending and revenue to balance each year is obvious and no doubt that numerous candidates will tout their support for a BBA as evidence of their seriousness when it comes to fiscal responsibility. However, the conversation regarding a balanced budget is becoming decidedly unbalanced, with political ideology trumping fiscal sanity. Before we get unhinged about a balanced budget amendment, let’s take a poised look at it. One need look no further than the states to see the popularity, and shortcomings, of a BBA. Proponents like to point to the fact that at least 45 states (and as many as 49, depending on the definition) have some form of balanced budget requirement as evidence of the feasibility and appeal of such an approach. What they don’t point out is that the budget situation in many of these states is worse than the abysmal federal condition. Less transparency and more budget gimmickry often result as policymakers seek to circumvent balanced budget constraints by keeping things such as public pensions and healthcare costs off budget. The fact that budgetary basket case California has a balanced budget amendment should highlight the limitations of this route. In addition, many states and localities, unlike the federal government, have separate budgets for capital expenditures, which are often financed through the issue of bonds. Therefore, translating the practices of states to the federal level is not as straightforward as it seems at first blush. One thing is clear; we will have a balanced budget amendment debate in the U.S. this year. The recent debt ceiling deal dictates that both the House and Senate must vote on a BBA between October 1 and December 31, 2011. The discussion will be intense, with many arguing that a BBA will be essential to improving our fiscal outlook. In order to be productive, the dialogue needs to be informed by some key points. First of all, many budget experts argue that the fiscal situation in this country has gotten so out of hand that balancing the federal budget in the near term is practically impossible. This contention is borne out by the fact that the budget plan passed by the House earlier this year, which slashes spending substantially, would not balance the budget within the next decade. This also underscores how difficult it will be to balance the budget without increasing revenue somehow. In fact, many conservatives in the past refused to support a balanced budget amendment because they feared it would inevitably lead to higher taxes. Such concerns were behind the crafting of the BBA supported by all Senate Republicans and a similar version that was approved by the House Judiciary Committee, which in addition to requiring a balanced budget, also calls for capping spending at 18% of GDP and a two-thirds supermajority vote in both houses to raise taxes. This approach, supported by many conservatives, goes well beyond a traditional BBA. Don’t be surprised if progressives respond with their own slanted version. We are already seeing it with a BBA authored by Senator Mark Udall (D-CO) that may serve as the Democratic counterweight to the GOP-backed version. Udall’s BBA would exclude Social Security from the balanced budget requirement and prohibit enacting tax cuts for those making over $1 million a year unless the budget is in surplus. Balanced budget requirements driven by political dogma will severely constrain the budget choices of policymakers and only make the fiscal situation worse. Instead of a rigid BBA, more flexible fiscal rules may be more effective. Experiences abroad offer momentum and insight. Italy recently agreed to pursue a balanced budget amendment to its constitution in order to reassure creditors about its spiraling debt. And recently the heads of France and Germany called for all Eurozone countries to enact balanced budget requirements as Europe deals with a deepening debt crisis. The international experience also provides some innovative ideas for a BBA. In 2001, voters in Switzerland overwhelmingly approved of a balanced budget amendment to the country’s constitution in response to rapidly rising national debt. The Swiss “debt brake” put a little twist on the traditional BBA. Instead of demanding a balanced budget each year, the Swiss version balances the budget over the economic cycle, meaning that the government is allowed to run a deficit when the economy is struggling in exchange for being in surplus during boom times. This approach negates one of the major criticisms of a BBA – that it hamstrings the ability of governments to respond to crises and prevents automatic stabilizers like unemployment insurance and welfare benefits from kicking in when they are most needed, during economic slowdowns. In 2009, Germany instituted a similar debt brake. Although it is too early to make any conclusions from Germany, the fact that Switzerland has weathered the global recession better than most countries has many looking there as an example for the U.S. to follow. However, some argue that the export-oriented Swiss economy has benefited from economic stimulus measures undertaken by its neighbors. Some also point out that the model is flawed because it is difficult to exactly define an economic cycle. Chile and Sweden also provide examples that should be examined. Yet, a major impediment to a balanced budget amendment is the fact that amending the U.S. Constitution is not an easy task. In addition to two-thirds majorities of both houses of Congress approving a BBA, three-fourths of the states must also ratify it. Relying on a long process with an uncertain ending while the fiscal situation deteriorates further is not a good option. The federal budget process is definitely broken and in desperate need of reform. But there are plenty of fiscal rules and budget reforms that can be implemented now, as opposed to going through the constitutional route. One of the projects I have worked on, the Peterson-Pew Commission on Budget Reform, has offered a detailed framework for budget process reform that will not require changing the constitution and will facilitate a fiscal plan to put the U.S. on the right course. Most importantly, process changes like a balanced budget amendment must complement, not supplant, concrete policies to reduce the debt. A balanced budget amendment, or any other fiscal rule, will not substitute for making tough budget decisions. A politician’s support for a BBA cannot stand as their sole, or even primary, solution to our fiscal problems. We need a comprehensive, multiyear fiscal plan that stabilizes the debt in the medium term and reduces it further down the road. Eventually, 56 men signed the Declaration of Independence, agreeing to “mutually pledge to each other our lives, our fortunes and our sacred honor.” It was not a hollow pledge. These were men of stature, and many of them of significant wealth. They had much to lose in attaching their names to this document. They put their status, wealth, and their very lives on the line in what was effectively treason against the Crown. No doubt many of the delegates who signed the document did not agree with every single word in it, yet they signed it nonetheless, even though so much was at stake personally. These men from vastly different backgrounds and political inclinations banded together for a purpose that was larger than any of their individual interests. And because these leaders were able to put their personal desires and differences aside in order to unite for a higher purpose, thousands of Americans took up their cause, leaving their homes, livelihoods and families to risk their lives fighting the most formidable army in the world in pursuit of independence. Unfortunately, we are now a long way from those days. Today, our leaders are more inclined to make pledges that divide, instead of unite us. Politicians on the right are compelled by interest groups to pledge not to raise taxes, even to the point of maintaining inefficient tax preferences for oil, gas and ethanol and tax breaks for the wealthy. Lawmakers on the other side are pressured to pledge not to do anything that affects entitlement benefits. The result is stalemate and inaction in addressing the budgetary challenges confronting the country. I believe that putting the U.S. on a fiscally sustainable path in a manner that enhances long-term economic growth and competitiveness is the challenge for our generation. We must recognize the moment at hand and summon the courage and cooperative spirit of our forefathers in meeting it. Left unchecked our mounting national debt presents a dire threat that rivals that posed by any conceivable military or economic foe. Only through a bipartisan process in which both sides engage in good faith with all options on the table will we produce the appropriate response. All will find some provisions unpleasant, but we all must understand that our fiscal predicament is so grave that difficult choices and tradeoffs will be required. We can overcome this challenge and emerge a stronger nation, just as we have with every past ordeal that confronted us. But it will require the same spirit of shared sacrifice, cooperation, determination, and vision that we have collectively mustered in previous trials. While this foe may not have a face, the consequence of failure certainly does. We need look no further than Greece to see the suffering and strife that can occur. While the effects in the U.S. may not be as pernicious, they will be far-reaching. Decisive action is required. The nation needs leadership now. So, as we fire up the grill and light the fireworks, let’s also resolve to address our fiscal challenges with the same fortitude that this nation was founded on. All the talk about the bulge in Rep. Anthony Weiner’s pants is distracting from the real bulge we should be worried about — our bulging national debt. Without action, our debt will hit unprecedented heights. 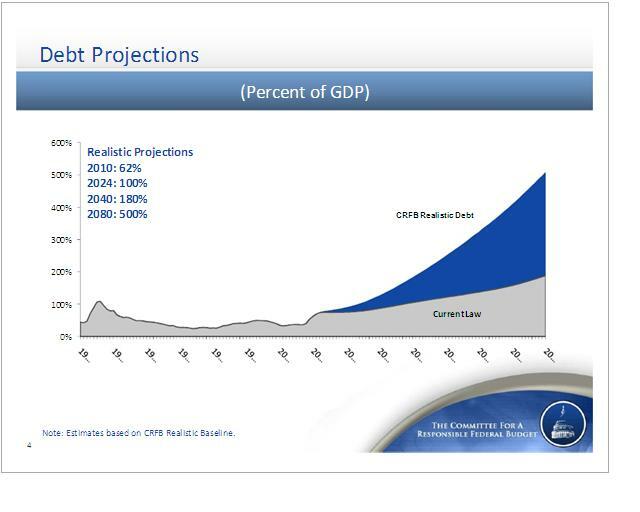 Under realistic assumptions, public debt is projected to reach over 120% of GDP by 2030 and over 180% by 2040. The graph below is the bulge shot that should be freaking people out. Bipartisan talks led by Vice President Biden and the bipartisan Gang of Six senators are trying to find solutions. Let’s hope they succeed. August is a relatively calm time to reflect before the stormy months ahead. Congress is currently in recess, the president is on vacation. By contrast, the period after Labor Day will be marked with shrill posturing in Washington and heated campaigning throughout the country ahead of the November election. I recently had my vacation with my family (and still recovering). Besides allowing me to get reacquainted with Carolina BBQ, Krystal burgers and my kids’ uncanny ability to frustrate and amaze me at the same time, it also enabled me to ponder some of the major policy events this year so far. Among them were a very unhealthy debate over health care which resulted in inadequate legislation, a deficit of bipartisanship and truth regarding the federal budget deficit and national debt, and little energy for energy and climate reform in Washington despite of the Gulf oil spill and other developments. All the while the sure-to-be-taxing debate over extending the 2001/2003 tax cuts has been put off, despite the fact that they expire at the end of the year. Now that it appears that any real action on climate and energy policy was capped along with the BP well, I feel it important to lament the opportunity lost. While our leaders are enjoying vacation, they need to be called on how they vacated their responsibilities on this issue. one way or another, we will have to pay more for energy, at least in the near term. Regarding the first point, many advocates of cleaner energy are unrealistic in their demands. Yes, we should have seriously begun transitioning away from fossil fuels more than thirty years ago, but we didn’t. So it will still take time to wean ourselves off of dirtier fuels. We must develop now the comprehensive energy strategy that we have failed to devise and implement for so long. But there will be a transition period between now and a cleaner energy future. A natural and realistic compromise is to expand domestic production of oil and gas in the short term in exchange for support of comprehensive energy reform in the longer term. The Gulf spill took offshore drilling off the table just when it appeared that expanded drilling would help pave the way towards such a compromise. Secondly, those who vociferously decry that efforts to reform our energy regime will raise the cost of energy are disingenuous since energy prices are sure to rise regardless, for a variety of reasons. First of all, prices are relatively low now because of the global economic slowdown, which is inhibiting demand. Few economists doubt that gas prices will rise significantly once the economy recovers and demand increases. The problem will become exacerbated over the long run as the U.S. competes more with growing economic powers such as China and India for dwindling oil reserves. Furthermore, energy prices will also rise due to increased legal and regulatory burdens in response to recent developments, including the Gulf oil spill and the Upper Big Branch coal mine disaster in April. The fact is that there are costs to our dependence on fossil fuel that are not reflected in the price we pay at the gas pump or in our monthly electricity bills. All too often the discussion on negative externalities is limited to climate change. This is unfortunate because, although not without merit, the climate change claims engender heated opposition and are difficult for many Americans to fully comprehend. On the other hand, external costs such as U.S. military involvement in the oil-rich Middle East, national security vulnerabilities of relying on oil from countries like Venezuela that are openly hostile to us, environmental damage such as mountaintop removal and oil slicks in the Gulf of Mexico and Alaskan coast, and the deaths of 29 miners in West Virginia and 11 workers on the Deep Horizon oil rig transcend partisan differences and are easier to appreciate. All this points to a basic truth that many experts recognize, but that few politicians want to face – putting a price on carbon will be essential to achieving energy reform. Accounting for the true cost of fossil energy will make alternative sources more competitive and spur conservation and efficiency measures. Market-distorting subsidies and mandates will not get us where we need to be. Another benefit of pricing carbon is that it would help improve the country’s fiscal situation. The increased revenues from pricing carbon could significantly reduce our national debt. While opponents of a cap-and-trade program have quite successfully stalled it in Congress by labeling it as “cap and tax,” with deficits and debt a top issue for voters, such an argument could be very persuasive. When vacation ends, hopefully also will the vacating of action. Amid the hoopla over incumbents being booted in primaries and debate over the impact of the Tea Party in elections, an important development earlier this month that could change the shape of elections — and hopefully of politics — has been largely overlooked. California voters approved open primaries, which promise to diminish the influence of the fringes of parties and favor candidates who cater to the center of the electorate. The success of Proposition 14 means that elections in the state will feature a primary where all candidates for an office compete against each other and the top two vote-getters, regardless of party affiliation, move on to the general election. The system is modeled after Washington state’s “top two” primary system that has passed muster with the U.S. Supreme Court. California has often been in the forefront of major transformations, namely the anti-tax and environmental movements. Combined with the adoption via ballot measure of serious redistricting reform in 2008, the state is now a leader in election reform. Reforms such as ending “Gerrymandering” and taking the redrawing of districts out of the hands of politicians, opening primaries, improving ballot access, and campaign finance reform can make elections more competitive, reduce the influence of special interests, improve the prospects of centrist candidates, and ultimately increase the interest and involvement of voters. Independent and third party candidates have a better chance in an arrangement where multiple candidates split the major party vote. I ask myself a simple question: If open primaries are such a boon to the major parties why were they the biggest opponents of the California initiative? The trick will be ensuring that ballot access requirements are such that they do not preclude viable Independent and third-party office seekers. Here is my list of 14 reasons (in no particular order) why the passage of Prop. 14 is a positive development. Voters will have more choices because they won’t be limited to just candidates from the party they are registered with. Think of the fun Jay Leno can have with this. He needs all the help he can get. Elections will be more competitive (especially in conjunction with redistricting reform). Voters will be more interested, and more likely to vote, in primaries that are more competitive. The extremes of the parties will hold less sway because candidates will have to appeal to voters outside of their party. Compared to the 2003 gubernatorial recall election no open primary will look nearly as chaotic. A broad coalition of supporters including the Silicon Valley Leadership Group, California Business Roundtable, California Police Chiefs Association, AARP, California Farm Bureau Federation, and California Forward defeated a well-financed opposition that included the parties. The Governator got a big win. Special interests like the state teachers union got a rare loss. It should make for some interesting primary debates. Of course parties will try to hold “invisible primaries” to anoint a candidate and clear the field ahead of the primary, but good luck with that. Abel Maldonado may be the future of the CA GOP. If California can pull this off, then any state can. Moderate voters will be courted in primaries for once.